Sports & Games Fee for Inter Schools Tournaments, Guidelines for utilization of funds: Sports and Games in School's - Guidelines for utilization of funds: Sports & Games Fee of Rs.20/- for promotion of Sports and Games and for strict implementation in all the schools in the state to encourage the children to participate in Sports and Games for improving their Physical and Mental Ability. 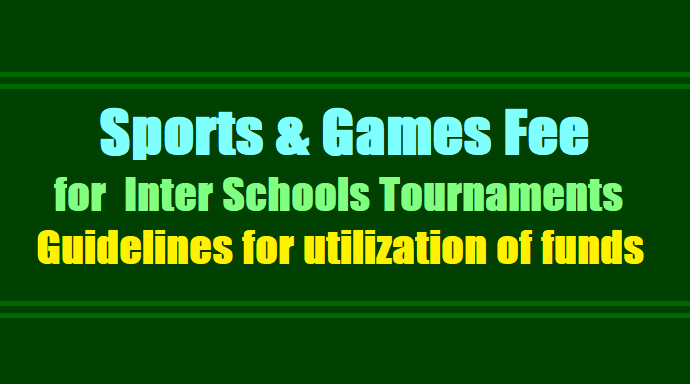 Sports & Games Fee to be utilized for inter schools Mandal level, District Level and State Level Tournaments. Rc.No. 1016(2) HDSGF/2017-18; Date: 17-06-2017. Sub: - School Education -DEO Hyderabad - Sports policy of Government - Promotion of Sports and Games in School's, Collection of Games fee of Rs. 20/- per year from each student - Guidelines for utilization of funds - Reg. 2. DSE AP, Hyderabad Procs. RC No. 200/D-1/02, Dated 10-08-2003. 3. G.O.Ms.No. 63, School Education, Dated 26-07-2012. As the Head of the Institutions of Government, Aided and Private Un-Aided and Recognized schools functioning under the jurisdiction of the D.E.O., Hyderabad District informed to collect Sports & Games Fee of Rs.20/- for promotion of Sports and Games and for strict implementation in all the schools in the state as per the G.Os in the reference Cited above to encourage the children to participate in Sports and Games for improving their Physical and Mental Ability. 1. All the Head of the institutions shall collect Rs. 20/- from each student of Classes VI to X in High Schools and VI & VII in Upper Primary School's for Sports & Games fee separately for the year 2017-18. The Head of the institutions shall deposit the amount of Rs. 6/- out of Rs. 20/- along with the strength statement format of the strength particulars is herewith enclosed. 3. The Amount collected shall be deposited in the nearby post office or Bank. A separate joint account shall be opened in the name of the Head of the institution and S.A (Phy,Edu)/PET of the school, Both will be jointly be held responsible for the collected amount and for maintenance of relevant Registers. i.e Ledger, Cash Book, Stock Register etc. 5. Rs. 6/- Multiplication of Total Strength of the Institution from class Vi to X High School's and VI & VII Upper Primary school's to be paid through DD in favour of Vice-President & Organizing Secretary, HDSGF, Hyd (Hyderabad District School Games Federation) The D.D, to be deposited on or before 31-08-2017 along with DCEB fee at DCEB office along with Strength particulars. The Hyderabad District School Games Federation Office (HDSGF) is Located at Government Model High School, Aliya, Opp: L.B.Stadium, Gun foundry, Hyderabad 500 001. 6. A Receipt in this effect should be enclosed to Nominal Rolls of S.S.C, and DCEB. The Assistant Commissioner 10th Class exams, Secretary DCEB, Dy. EOs, Dy.10S are requested to ensure that all the Head of the Institutions may be deposited the said amount through D.D to Hyderabad District School Games Federation. 7. Further School committee is authorized to collect voluntary donations from the individual persons/organizations like Lions Club etc., for infrastructure facilities for promotion of Sports and Games in the Schools. 8. Under no Circumstances the collected amount shall be utilized other than Sports & Games activities. 9. First-Aid Kits should be provided in each school compulsory. 10. The entire accounts under these items should be placed before the departmental Auditor every year for Audit. 11. The S.A (Phy.Edu)/PET should regularly coach the students in the respective Sports and Games. 13. Every School should follow G.O.Ms.No.63 i.e. Physical Education activities in all schools compulsory.